In February, we hosted students from the LionheART WORKS vocational program. It was a fun day and we had a great time with this group of wonderful kids. Here is a note from Kathe Robertson about their trip to the Puff n Fluff Pet Spa. LionheART WORKS is a vocational program that operates out of the LionheART School in Alpharetta that provides individuals, 18 and older, with customized work experience while teaching basic employment skills. The curriculum is designed to teach independence and communication-matching educational strengths with work-related activities. Offsite work settings are selected based on individual student’s affinities, or areas of interest. 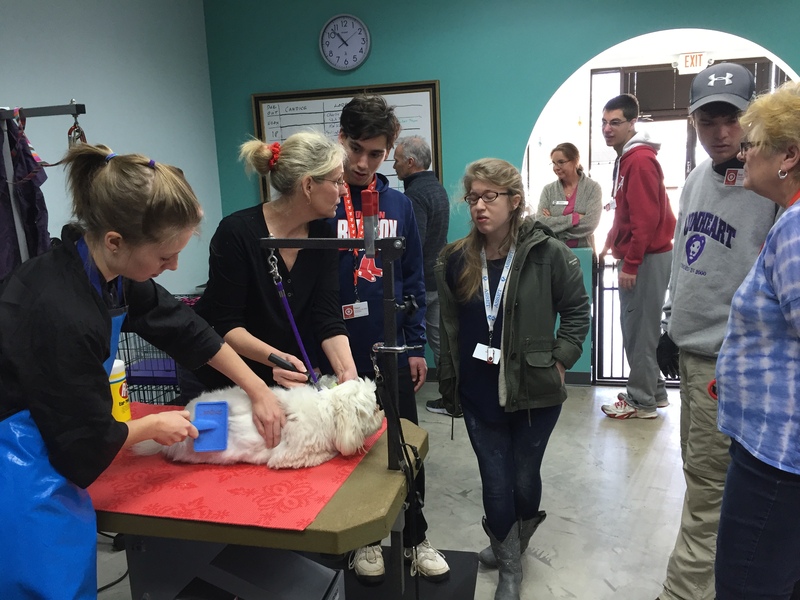 The students explored the field of pet-grooming at Puff n Fluff Pet Spa where Candice and Kirk showed them how dogs and cats are groomed. 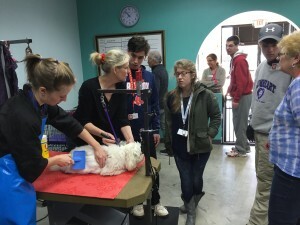 The students were taught about the different brushes used for grooming, how different pets are bathed and dried, and how the pets get haircuts and have their nails trimmed. The students asked Candice and Kirk great questions! Puff n Fluff Pet Spa will also have items such as dog collars and bandannas, clay dog bowls and ornaments, pillows and other animal related items for sale that were created by students at the school who participate in LionheARTisans- a program that provides Lionheart students the experience of a small business environment that combines art, academic and job skills that utilizes and re-purposes donated and available materials to create marketable items. – Thanks Puff ‘n Fluff for a great learning experience!